What does Istokpoga mean? "People have died there" It was so named by the Seminole Indians because in the early 1800's, before they became a tribe, their people tried to cross the waters of Lake Istokpoga and were swallowed up by whirlpools. Nearly 28,000 acres, lake Istokpoga is one of the best fishing lakes and the fifth largest lake in the state of Florida. Anglers travel from all over the state and nation to fish Istokpoga. Birds of many species fly its massive boundaries and alligators of all sizes roam its marshy flatlands. The average depth of Lake Istokpoga is four to six feet, and it is fed by two creeks, Arbuckle and Josephine. The sunsets on Lake Istokpoga are unsurpassed. Lake Istokpoga has been designated a Fish Management Area by an agreement between Highlands County Board Of County Commissioners and the Florida Game and Fresh Water Fish Commission. There are several fish camps and fishing guides on lake Istokpoga, providing recreational and serious anglers alike, many hours of enjoyment. There are four public boat ramps and a dedicated park on the lake. Check our Associate Members Page for more information about the businesses around Lake Istokpoga that support our organization. For other businesses check our Links Page for the Lake Placid or Sebring Chambers of Commerce. 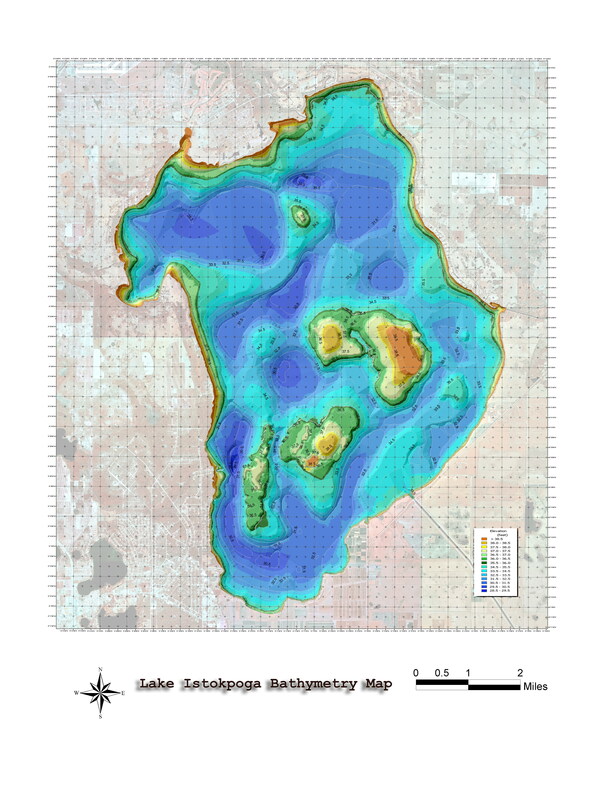 We have a bathymetric map of Lake Istokpoga available for download. WARNING: this file is big. It is over 4 megabytes. Please do not download it if you are using a dialup connection. Click here to download the file.